Introducing Twiddy's first home with its very own lazy river styled pool! This home accepts future year reservations more than 51 weeks in advance. Current year guests are not offered first right of refusal. *** Advertising Update *** The exercise room will now include a Peloton Cycle! The integrated video screen let's guests join studio cycling classes from the comfort of the home via live studio sessions with world class instructors from around world! "Sound to Sea Beach Club" embodies lavish oceanfront living and design. With exclusive features such as a lazy river styled pool complex, over 12,000 square feet of living space, 16 master bedroom suites, custom showers with imported tile, an elevator and direct beach access, guests will encounter an unparalleled vacation and event venue. Perfect for your event, a 30x60 area will be available for a tent on the oceanside of the home between the house and the dune. This home offers both an eloquent backdrop for your special event or unforgettable family vacation. The design of the home was carefully developed to offer both private spaces for sanctuary and very generous gathering places for socializing and enjoying events. Level three is particularly open and large, with expansive living and dining areas. "Sound to Sea Beach Club" offers two kitchens - both a chef inspired commercially styled kitchen, as well as a large custom family kitchen, with panoramic water views. Two bedrooms and a two-story Olde European Pub rest adjacent to the west and overlook the Currituck Audubon Sanctuary and Sound. All common rooms on this level work seamlessly together to create the ideal setting for any reception. Guests will revel over ocean sunrises in the morning, and may enjoy favorite drinks in the pub as they take in spectacular OBX sunsets over the sound. Decks conveniently flank both sides of the home for this very reason. In between the rising and setting of the sun, abundant sunshine continues to filter into all common areas through three expansive cupolas, with over 50 windows, soaring over 25 feet into the air. Eight master bedrooms may be found on level two, including a lavish honeymoon master suite. Brides and grooms will appreciate the spectacular design of this room, which is complete with its own eloquent fireplace, dressing room, private soundside sitting area with a wetbar, and a private deck with a Juliet balcony. The suite bath is equipped with an imported clawfoot tub, custom tiled walk-in shower with massaging jets and rainfall showerhead. The rest of this floor is comprised of the remaining seven master bedrooms, which flank a library, and a very large den, complete with its very own stone fireplace and a remarkable "boat bar" which overlooks the ocean. The den area comes complete with a coffee/tea bar to help you start your day. A separate exercise/yoga room is provided with mirrored walls and fitness equipment. The exercise room will include a Peloton Cycle which lets guests join studio cycling classes from the comfort of the home via live and on demand studio sessions with world class instructors from around world! An expansive east facing deck provides yet another place to enjoy the serene coastal landscape and ocean views after your workout. Level one includes six master bedrooms, a mini indoor kid's basketball court, separate kid's play cave, spacious tiered media room, and a large recreation room with an arcade and kitchenette with a glider window, perfect for serving outdoor guests. The bar area will feature 3 large flatscreen tv's so guest can enjoy multiple sporting events while enjoying their favorite drink. Enjoy a game of pool on a billiards table converted from a red 1965 Mustang Car! A double glass slider opens to the pool complex, which offers a relaxing lazy river pool, complete with a swim up bar, as well as a bridge leading to an island in the pool's center. The shallow flat area of the pool serves as either a kiddie pool or a great place to put your beach lounges in the water. The lazy river feature effortlessly glides guests around the circular end of the pool, so they may relax and casually drift around. Of course, they may also anchor at the bar for a refreshing drink. When guests are ready to dry off, they may putt on their very own putting green, relax in the tiki bar, enjoy the large hot tub, play a game of outdoor ping pong, or venture to the dunedeck to take in salty sea breeze. The impressive array of amenities in this home is well complemented by those offered to guests of Pine Island Reserve. Arriving guests are welcomed by a caretaker who will familiarize guests with the home. Other exclusive features include upgraded linens, daily beach chair and umbrella set up from April 29 to September 29, and more. Guests of this home receive reduced greens fees at both the Kilmarlic Golf Club and The Currituck Club, and for a small fee, use of the Pine Island Racquet and Fitness Center. Six MBRs (K, K, K, K, BS/DBS, BS/DBS with play area); theatre room; rec room with kitchenette and pool table; laundry; half bath; outside half bath. Bridal Suite MBR (K) with three-sided fireplace, sunset dressing room, clawfoot tub, tile shower, and private balcony; seven MBRs (K with private deck, K with deck access, K with deck access, K, K, K, K); library with breakfast bar and gas fireplace; boat bar with built-in bench seating; laundry; exercise/yoga room. Two MBRs (K, K) each with private deck; great room with cupola and gas fireplace; separate chef's kitchen; custom kitchen; dining area; olde Irish style pub with cupola; half bath. Reduced greens fees at the Kilmarlic Golf Club, beach cabana service provided from April 29 to September 28 only (provides morning set-up and afternoon take-down of two umbrellas and six beach chairs on the beach). Pets welcome (2 dogs max). No additional fee or deposit required. This home is currently accepting 2020 reservations. 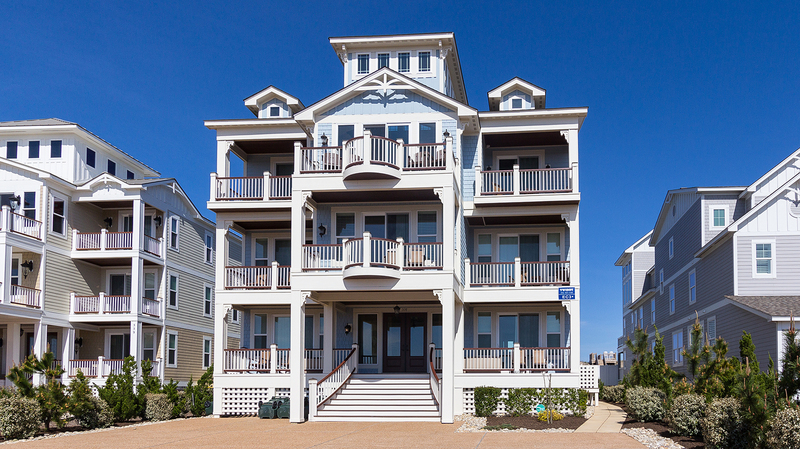 Click to visit homeowner's personal website for this home at, www.soundtoseabeachclub.com/ - a new window will open. (Twiddy only warrants the accuracy of the information contained in its web site and will not be held liable for the content of others). Best family vacation we ever had. The home was great. We had a wonderful week and look forward to our next visit to the outer banks. The home is absolutely fabulous! Both décor and amenities were over the top. Our families absolutely loved everything, both inside and out. This home was built and decorated with lots of attention to detail. The owner did a fantastic job of truly making the home a resort unto itself. This was especially appreciated when we had rain that kept us indoors. This vacation home was just awesome for our family reunion! We came from Indiana, Chicago, Virginia, Alabama and Germany. Their was so much to do from movies, video games, corn hole, ping pong, shuffleboard and the Ford Mustang pool table! Not to mention the lazy river and awesome pool!! The decorating was unbelievable!! We would definitely go here again! This beach house was awesome! It could be summed up in one word: "Wow!" The individual rooms were lovely and I really liked the theme of each room. I loved the size of the dining room table, as we were all able to have dinner together. The house was well laid out, but I would've thought the bridal suite would've been facing the ocean. Also, the pies upon arrival were a nice touch. Unbelievable beach home. The pictures hardly do it justice! This house is amazing. It’s the first house in 20 years of coming to the OBX that our family group of 32 would come back to. The beach wasn’t crowded, the pool was fun, the house has fantastic views. It had everything we needed and then some. We really liked how it wasn’t over crowded on the top floor, but open and homey. The owner had pies for us as well that were amazing. We loved this house. We loved our stay at this home. It was our family vacation as well as the venue for our daughter's wedding and it could not have been more special. The owners clearly put time and effort into making sure their guests feel welcome and very comfortable. The pies they left for us were awesome too! Very thoughtful! We look forward to our next OBX trip and plan to stay at "our" Sound to Sea Beach Club (for that week, it feels like home!). Thank you for making our stay and our daughter's wedding so memorable! Hello, is there corn hole boards and volleyball court in the back yard or is this items we would need to bring? EC3 offers corn hole, volley ball, bocci ball, and ping pong. I see there are 2 taps. Is it possible to order the kegs to be installed/delivered on the day we arrive? That is an excellent question! EC3 has two keg taps, one located in the Level 1 Bar and one located in the Level 3 bar. They both hold half or pony kegs. For keg rentals, you might contact The Butcher Block (252) 453-3663 or Growlers to Go Duck (252) 715-1946. They should be able to accommodate delivery on your arrival day. Thank You for your inquiry, Teri! EC3 can accommodate up to 12 cars. Does the event fee mean there are certain items included in our stay and wedding ? Does this home have Keg Taps? Great question, EC3 has two keg taps, one located in the Level 1 Bar and one located in the Level 3 bar. They both hold half or pony kegs. Is there a crock pot / slow cooker at the house? Excellent question, Diane! EC3 currently provides a crock pot. However, crock pots are not a guaranteed amenity and are subject to change. we have a few guests that will be flying in, what is the closest airport to the house? Thank Your for your question, Eileen! Virginia’s Norfolk International Airport (ORF) is the closest major airport to the Outer Banks with a 2 hour drive. Are there lifeguards at this section of the beach? Thank you for your inquiry, Eileen! The closest lifeguard stand to EC3 is located at the Hampton Inn. Is there direct access to the back of the home and pool area? For the 2018 season, a concrete walkway will be installed on the right side of the home from the driveway to the rear patio which is directly accessible to the deck and rear entrance. Therefore, no stairs will be needed for entry. Do you know the type of coffee maker, kuerig or regular brew? Sheryl, EC3 offers both a Keurig and a standard drip coffee maker for guest's use. when will the dates for 2019 be available to book? What dishes and utensils are available for renters? In what quantity? I know it's not listed on the amenities but do you happen to know if there is a high chair at this house? Thanks! Baby equipment is not a guaranteed amenity for Twiddy homes. If you would like to rent baby equipment for your stay, Just for the Beach, Moneysworth, and Ocean Atlantic Rentals all provide baby equipment rentals. For contact information, please visit www.twiddy.com/activities/services.aspx. Tara, these are great questions. Items such as boogie boards are not standard amenities for our homes. If you would like to rent beach equipment for your stay, Just for the Beach, Moneysworth, and Ocean Atlantic Rentals all provide this service. For contact information, please visit www.twiddy.com/activities/services.aspx. Netflix is available in the home. Thank You for your inquiry, Teresa! EC3 is located on the paved road of Corolla, and can be accessed by all vehicles, 4WD vehicles not necessary. Hello! I am wondering if the video games (Pac Man, etc.) require coins to operate or if they are set to be used without having to insert any money. Thanks! The Beach Cabana Plus service gives us 2 umbrellas and 6 chairs--is there a way to rent additional chairs and umbrellas? Barbara, according to the floor plans, Bedroom #11 offers a shower/tub combo. Yes, house has Premium Netflix. Does the home's sound system offer an iPod/iTunes dock? Good news, Gary! EC3 has an ipod/iTunes docking stations throughout the house. In the bunk bed rooms, there are numerous charging stations as well as Sonos throughout. When does the pool open for the season and what is the heating cost for the pool per week? That is a great question Charlene. The pool for EC3 will open for the season on April 30. The cost to heat the pool for the week is $475.00 plus tax. Is there a screen porch and are any of the king rooms convertible to two twins? This home does not have a screened porch, and unfortunately the beds do not separate into two twins. Great question! The hot tub will be on the back deck area of the house. Is there a shallow end in the pool, or a baby pool? Jamie, sound to Sea Beach Club offers the first Lazy River home in the Outer Banks. The impressive pool starts with a flat 2 feet deep area great for kiddie pool or a place to relax in your beach loungers with water surrounding you. You can then step down into the main pool area which descends to 5 feet. In between these two pool areas is a swim up bar. A fun Lazy River circles the entire pool and even goes under a bridge with water jets (tubes provided!). Will the pool area be completely fenced? The pool area will be completely fenced in. There will be a gate that will provide direct access to the oceanfront dune deck and beach - very easy access. Will the area that is set aside for a tent have the proper electrical hookup for a band? Hi Skip! Yes, electrical outlets will be readily available in the designated tent area. I see there is a special event fee... what does this cover if we were to have a wedding here?